After having put it off for several years after the Israeli-Jordanian peace agreement, I at last made the pilgrimage trip to Petra like all good Israelis. The one-day trip to Petra from Eilat is OK for people who can afford only to have short vacations. 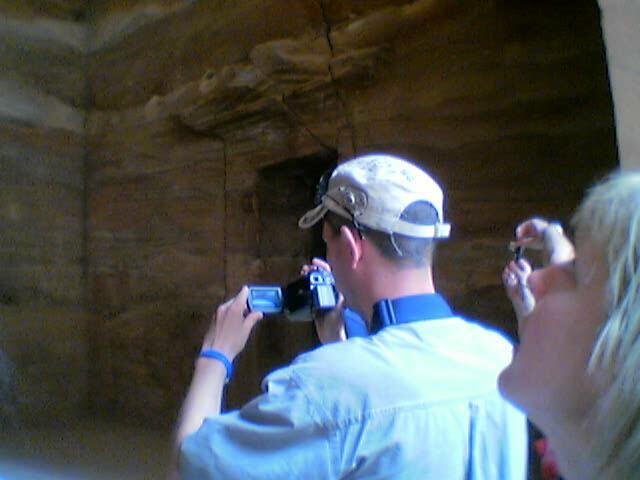 You spend a full day and pay hefty border-crossing fees just to see ancient Petra for two hours. Ancient Petra has enough stuff to keep you exploring it for hours, and several people prefer to sleep overnight in one of the hotels in the newer part of the city. Speaking of the newer part of the city, one of the things they don’t tell you is that the city has some very steep roads. When planning the trip to Petra, S. and me inquired and found that the logistics (low frequency public transportation and border opening hours) make it mandatory to join a guided tour if we want to accomplish it in a single day. We registered for the tour operated by Desert Eco Tours, even though it was a bit more expensive than tours organized by other operators. It was indeed well-organized – we got across the border in the morning without undue waiting in queues. An unlikely chain of events, rather unlike my past experience, brought me to London. Before departing from Israel, I was pitied because I chose the wrong time for a vacation in London. Large part of my luggage consisted of clothes meant to defend me against the arctic cold of London. The friends, at whose home I planned to stay during my London stay, had their own plans for Valentine Day (plans of the kind which merits “Mazal Tov” from everyone who knows them), so I stayed in a hotel for the first two nights. My hotel room had a radiator which could not be turned off by the room’s tenants, so any cold, which the London weather was supposed to inflict upon me, avoided me instead. London also turned out to have several sunny hours, and not to be as cold as feared, so I did not use some of the warming clothes which I brought with me. Anyway, I had the fortune to visit one of the offices of European Relay as it was starting its operations in Israel. Hopefully, they will at last provide the deaf in Israel with adequate relay service. My hosts and me also saw the congestion in the Chinatown part of London, as the Chinese New Year was being celebrated. This was also my opportunity to experience, at last, Terminal 3 of the Ben-Gurion Airport. No account of my trip to London can be complete without a mention of the big surprise, which awaited me at its end. When I was in the Heathrow airport, preparing to check in my luggage, I saw an head, which I dimly recognized. I approached the head and it was very similar to the photo, which I see frequently in my MSN Messenger chats, as belonging to an English girl with sharp tongue and teasing sense of humor. When I came nearer, I said the nickname, which I use on her in our chats (an Hebrew translation of her real nickname). She was so startled that she almost jumped out of her skin. It was her! She explained to me that she came to the airport to see off one of her friends. We agreed to have a proper meeting next time I come to London. This evening I found myself with some free time on my hands while in Dizengoff Center. So I wandered around its less traveled corridors. Turns out that top floors of the Dizengoff Center have corridors, which qualify to be high-class bohemian areas. The top floors have all sorts of strange shops. Occult, cabala, gifts, scents, tattoos, piercing, you name it. Those shops look well-maintained, clean, high class. Unlike your usual bohemian quarters. Do not bother to look for those shops at the bottom floors. The bottom floors have more conventional mix of shops – clothes, restaurants and cafes, electrical appliances, bookshops and other conventional stuff. The big surprise is why Dizengoff Center is not more famous for its collection of strange shops in far away corridors. Yesterday evening I was in a meeting, which will lead – if there is enough interest – to a creative writing workshop. We were asked to write about an imaginary forest. My version of imaginary forest was based upon the real forest at entrance to Jerusalem. When driving on road No. 1 toward Jerusalem, after you survive the drop after Qastel and the Motza Illit junction, you leave the road for a road, which goes to Beit Zeit. There are buildings of Motza Tahtit, but you proceed toward Beit Zeit. The area is not well-developed forest. When you arrive near Beit Zeit, you take turn to the left, pass near the public swimming pool of Beit Zeit (or at least whatever remained of it). You eventually do enter the forest and continue driving the narrow and one-way road toward one of the entrances of Jerusalem. You feel you would like to have the forest continue forever, or at least for considerable distance. However…it ends after few Km, and there are rubble, trash and buildings on the sides of the road. The trees end as well. Such a place makes me feel sad. There are not enough areas of nature around in this small part of the world. Maybe once there are Dyson spheres, there will be enough room for wild nature together with much larger human population with all its civilization trappings. Few months ago, I was in a Bekol-organized tour in the Neve-Zedek neighborhood of Tel Aviv. Today I had a similar tour in Florentin neighborhood, which lies to the southeast of Neve-Zedek. This time, we had to pre-register for the tour. Apparently, the need to pre-register did not deter people from joining it, and the group counted about 40 people – significantly larger than usual. We started today’s tour in Beit Immanuel and visited the Immanuel church (formerly German church) next to it. The area had an interesting history. It started by a group of American religious zealots, who figured out that Jesus would come again if Jews return to Palestine. So they immigrated to the sorry land to prepare it for the Jews. They were not successful in their venture, and returned back to USA. Some of them needed monetary assistance from none other than Mark Twain to return to USA. Their buildings were built of wood. Their buildings were then inhabited by the German Templers. The Germans were very successful in settling in some places in Israel (there are German neighborhoods also in Jerusalem and Haifa). Their nemesis was their Nazi tendencies, which caused the British to eventually remove them from Palestine during World War II. The Immanuel church is built differently from the usual buildings in Israel, and entering it makes you feel as if you left Tel Aviv and Israel and are now somewhere in Europe. We next visited a restaurant, whose name is that of Jesus Christ and the ADMO”R Melubevitch. Officially its name was “Messiah ben David”. It, too, was a culinary delight. The third tasting place, where we were at end of our tour, was Conditoria Slonicky, where the sweets were prepared according to the tradition of the Jewish inhabitants of the Greek town of Slonicky. In middle, we visited the museum in memory of Avraham “Yair” Stern. He was the leader of LEHI, the third and smallest group of freedom fighters, who fought the British Mandate. He was captured in the house where the museum is now, and was brutally murdered by the British police officer who caught him. One leaflet caught my eye. The leaflet announced that LEHI is disbanding as the State of Israel has been founded. They declared that they do not recognize the authority of the British Mandate, the Jewish Agency, the Hagana, etc. etc. But the recognize and accept the authority of the State of Israel. This explains why they were not a troublesome political factor after the War of Independence. Several of the LEHI members enlisted in the IDF and other Israeli defense organizations. Several years later, one of their leaders became Prime Minister of Israel. I find it amazing that before founding of the State of Israel, there were three freedom fighting organizations, which were not always at peace with each other. Yet, in the years since then, the leaders of all three organizations had their turns at being Prime Ministers of Israel (first, David Ben-Gurion, then Menachem Begin and finally Itzhak Shamir). And this was accomplished solely through the ballot box, without bloody or bloodless revolutions. I feel this is amazing. Another interesting tidbit is about the Jewish suicide bombers. Two freedom fighters were captured by the British and were sentenced to death by hanging. They and their compatriots decided to smuggle a bomb into their cell. Then, a moment before getting hanged, they are to explode the bomb in the execution chamber, thus dying from it and taking with them several British officers and soldiers. The plan was foiled because a Rabbi insisted upon being with them when they are executed. They did not want to hurt him, so they hugged each other in the cell two hours before being brought to the execution chamber and exploded the bomb between them. The tour lasted four hours, rather than the two hours which are customary length of Bekol-organized tours to interesting places in Tel Aviv. Neve-Zedek neighborhood was the first neighborhood out of Jaffa in the area which later became Tel Aviv. It has been neglected for several years, but at recent years, its homes are getting preserved and renovated. The area is becoming an artists’ area. Today I was in a guided tour organized by Bekol, an organization of hard-of-hearing and deafened people. The tour was made accessible to people with hearing impairments thanks to a FM system which allows the hearing aid using participants to hear the guide’s story even against background noise. There was also a Sign Language interpreter for people (like me) who don’t benefit from hearing aids. We met outside Nachum Gutman’s museum (some of the Web site’s features do not seem to be available in Mozilla 1.4 without the appropriate plugins) in 21 Shimon Roceach St. The next half hour was spent looking at his pictures and marvelling at the times during which it was true that “Tel Aviv is a small city and people in it are few” (the title of one of Gutman’s books for children). The next stop was in Chelouche House. It was the first house built outside of Jaffa, by the Chelouche family, which was a very well-to-do family. This building was neglected for several years, and only very recently it was renovated and turned into a combination of museum and concerts hall. On the top floor of the Chelouche House, there was an exhibition of photos taken of the Neve-Zedek neighborhood by a photographer, who lived in the area. Our guide told us that she tried to make an appointment with the photographer to meet us and talk with us about his photos, but she was not successful in getting his phone number from the “144” phone company service. Why? The attendant didn’t understand what the guide wanted from her. Why? The photographer’s name is Honi Hamagel (Honi the Circler). This is the same name as someone from Talmudic days, who had fate similar to that of Rip van Winkle. We also had a brief look at the outside of Dallal Center. The tour ended for me personally with an ice cream serving from “Gelidat Savta” (Grandmother’s Ice cream) in Yehieli St., near to Chelouche House. I ordered ice cream there the way I usually order food in an unfamiliar gourmet restaurant – by asking the attendant which tastes she recommends. I don’t understand how she rightly guessed that I am a chocolate/coffee based ice cream type rather than fruit based ice cream type. Or is their chocolate based ice cream better than fruit based one?